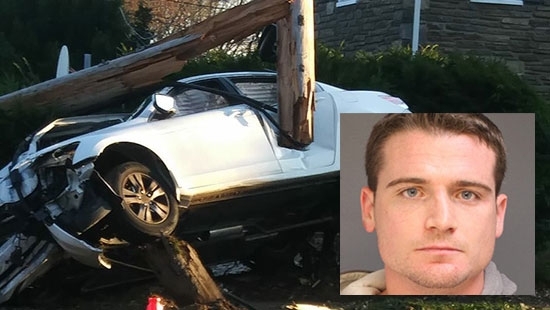 Upper Darby police say that a man was under the influence of heroin when he drove through a telephone pole in Delaware County on Sunday afternoon, 11/11. It happened around 2:30 p.m. on the 3300 block of Township Line Road near Edmonds Ave. According to Upper Darby Police Superintendant Michael Chitwood, 27-year-old Ryan McClatchy of Drexel Hill snorted heroin before the accident. He then drove his white Honda Accord into a utility pole. The pole snapped in half and the car became wedged between the two pieces. Chitwood says that when police arrived, McClatchy was lying on a nearby lawn. It took multiple doses of narcan to revive him, otherwise he only had minor injuries. No one else was injured. Around 100 residents were without power as PECO crews worked to replace the pole. McClatchey has been arrested previously for both DUI and drug possession. He faces several charges including DUI and reckless driving. Firefighters in Huntingdon Valley had to battle a large house fire Monday afternoon, 11/12, in Montgomery County. The fire started around noon on the 2100 block of Terwood Road in Upper Moreland Township. The 18th century home was engulfed in flames with fire seen shooting from the roof and heavy smoke. No one was injured. The cause of the fire was not immediately known. The Atlantic City Prosecutor's office is reviewing an incident from early Sunday morning, 11/11, at the Golden Nugget Casino that involved the mayor and an at-large councilman. The incident occurred around 2:20 a.m. outside of the Haven Nightclub at the casino. Mayor Frank Gilliam Jr. and Councilman Jeffree Fauntleroy II and three other individuals were involved. When questioned about the event on Sunday, the two officials characterized the incident as a 'verbal disagreement' or a 'loud argument.' Since then, several news outlets have seen video of the confrontation and say that it was a physical confrontation and a violent altercation with punches thrown. A complaint was signed against the two elected officials. There have been no further statements from those invovled. Philadelphia Phillies manager Gabe Kapler has lost his home in the Woolsey Fire near Malibu, CA. He and his family are safe.